The board of 81 circles is at left waiting for you to fill it. Edit: I can do it with 8. It is obvious that each triangle remove only 3 circles. Otherwise it will be simple. Why I showed three colors for each triangle? So you have theoretically 81/3=27 as maximal number of shapes. But the reachable maximal number is far less. Your solution is not correct. houlahop wrote: It is obvious that each triangle remove only 3 circles. Otherwise it will be simple. Can the same circle be a vertex for more than one triangle? Can the sides of one triangle pass through the vertex of another? Does every circle have to be the vertex of a triangle? "At right you have samples of isosceles triangles connecting three circles"
Is there any precision about right triangle or not? no. So triangles could be right or not. Just watch carefully my examples : you have right triangles and not right triangles. It is clearly obvious without any explicit rule that the same circle can not be a vertex or more than one triangle otherwise you could more than 27 distinct shapes. Rules are clear enough across my examples that thinking otherwise means that the puzzle is easily solvable. Which is not. Sometimes even if you give explicitly all the imaginable rules it will probably remain some cases unclear. Anyway the solution is hard. If I were to apply the rules you understood then there will be no puzzle at all. The solution will be trivial one. I will add there there are many shapes that you could as long as they use isosceles triangles. The circles are just a representation of points. You could reduce them to points if you want so then you will see all the possible distinct shapes. It is hard puzzle harder than you could imagine. In this picture you have 3 different shapes. You could list more than those 3. 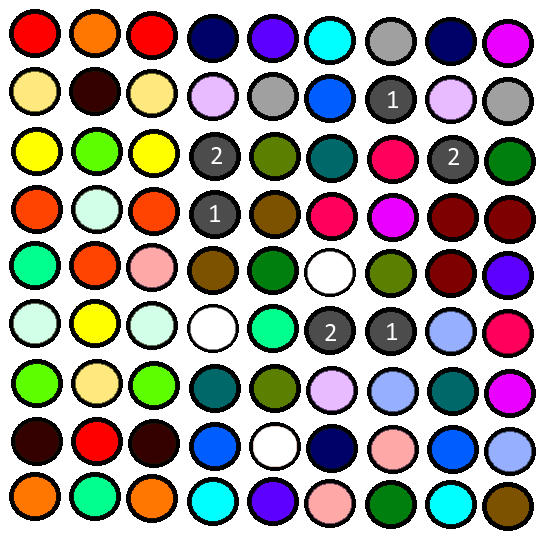 Each color represent a shape. Draw a grid 9x9 with intersections instead of circles and try to imagine all kind of isosceles triangles linking 3 vertex. After doing that try place the maximal number of distinct shapes on the grid by numbering them (1,2,3.....k). Each 3 vertex will be numbered. No, in the examples in your first post, you only showed triangles with a right angle, i.e. with angles 45-90-45.
houlahop wrote: Rules are clear enough across my examples that thinking otherwise means that the puzzle is easily solvable. It was not clear whether any circles that lie exactly on the edge of a triangle were considered connected or not. None of your examples showed such an edge circle also being used as the vertex of another triangle. So it was a perfectly valid interpretation that such edge circles were also connected and therefore could not be reused as vertices of other triangles. That is not an easy problem either, and leads to solutions like SirGabriel's. The right to progress is to ask for clarity before trying to solve the puzzle. It is a hard puzzle. Jaap you are right for the first comment. My examples were not giving triangles other than right. I answered quickly because I had in mind many pictures I did not post. I assumed that people finding quickly trivial solutions will ask themselves why before posting. I was wrong. This puzzle could be a 2 player game Nim-like. A print and play game using pencils and a printed board. The grid 9x9 or 3nx3n start empty. On his turn a player choose three vertices to form a DISTINCT isosceles triangle and put on each circle his symbol (* versus x for example). The last one to make legal move win. All the isoceles triangles played on the board MUST BE distinct. houlahop wrote: The right to progress is to ask for clarity before trying to solve the puzzle. houlahop wrote: I assumed that people finding quickly trivial solutions will ask themselves why before posting. I was wrong. It's an interesting philosophical question: who is responsible for making sure the solver completely understand the puzzle, the puzzle creator or the puzzle solver? Granted, that comic isn't representative of what's going on here, but still, the puzzle creator is the one who knows the rules, and so is the one who needs to make sure those rules are understood. Kind of a moot point now, but that's only assuming that at least one side has to be parallel to the axis. For example, using chess notation, a1-b3-d2 would be a right isosceles triangle. If no one has a solution I will post mine in the next days. houlahop wrote: So you have theoretically 81/3=27 as maximal number of shapes. But the reachable maximal number is far less. I realised in your image it simply says that triangles are distinct if their equal sides are of different length. However, for example, I have 2 triangles whose equal sides are sqrt(20), but one's 3rd side has length 4 and the other's has length sqrt(40), so surely they're distinct. Likewise for basic triangles with equal sides of sqrt(5) - their 3rd side could have a length of 2 or 4. That's what people have done. My examples were not giving triangles other than right. I answered quickly because I had in mind many pictures I did not post. It's hard to progress when your original post isn't clear, when you respond condescendingly to people who ask for clarification, and when some of your responses are factually incorrect. People often post puzzles with trivial solutions they didn't think of. I`m not welcomed so bother? You're welcome, just don't get upset when people don't completely understand your problem after one post in your second language.